New York Fashion Week is important for designers. Not only do they show off their new collection, they have a platform to make statements and change history. This year, designers used the stage to redesign women’s fashion. Over-sized coats with feminine details dominated the runway, while classic styles begin to make a comeback. #1. Marc Jacobs – Marc Jacobs is always a jaw dropper with unique, yet still ready-to-wear, designs. This year, the brand did the unthinkable. No music. No cellphones. Models walked down the runway, and then proceeded to exit outside onto the 36 degrees New York streets. There they took a final pose, proceeded to sit down in metal folding chairs, and whipped out their phones to take selfies. The clothing was able to speak for itself. The ready-to-wear collection was the most instagrammed of all fashion week shows. Well-played, Marc Jacobs. #2. Calvin Klein Collection – As America’s most recognized fashion brand, Calvin Klein is known for their simplicity, denim, and tailoring. The brand’s new Belgian chief creator officer, Raf Simons, debuted his first line this past week, wowing the crowds with a blend of feminine detail, bold colors, and tailored lines. #3. Thom Browne – With an ice skating rink, penguins, and live lamposts, Thom Browne is not a newcomer in the show-stopping department. The brand dressed women in men’s suits and large coats with contrasting elements, such as rainbows. The show left everyone in awe by boldly, and successfully, challenging gender stereotypes. This is why fashion and fashion shows matter. #5. Coach 1941 – We all know Coach for their beautiful leather purses, but the brand’s clothing line triumphed this year at NYFW. The collection merged typical masculine pieces with feminine florals and textures. The show itself demonstrated appreciation for the American landscape, with a prairie house at the end of the runway. # 6. 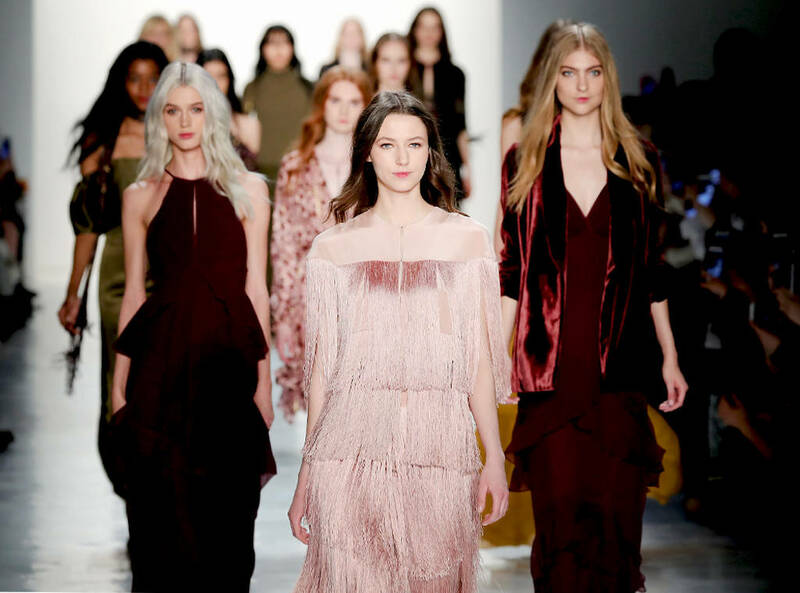 Marchesa – Ethereal, feminine details encompassed this luxurious fashion brand. Established in 2004, this fashion house is best known for their beautiful gowns, including wedding dresses. This year, the brand used Imperial China as inspiration for detailed embroidery and some bolder colors. #7. Tory Burch -This year, the popular brand enhanced the femininity that has long defined it. The show was held in the Whitney Museum of American Art and was detailed with hearts and hot chocolate. The pieces themselves brought back the classics and were light and floral. #8. Delpolzo – The collection displayed a strong architectural appreciation. The colors were inspired by a Hungarian painter, József Rippl-Rónai, from the 1890s. Delpolzo is art in design. #9. Gabriela Hearst – Hearst launched her line 2 years ago, and this was her first formal runway. She focuses on luxury in materials, while her peers tend to focus more on design. Her show was environmentally friendly, she even brought chairs from her house. These differences made her presentation a stand out during NYFW. #10. Yeezy – Kanye West is no stranger to making statements, and his latest collection did just that. The brand demonstrated how denim can be worn loose and comfortable, while still dressing for purpose. To enhance the importance of each piece, instead of a typical runway, West had a large video screen showing the models walking in the collection.